Directions: From Sheikh Zayed Road take interchange 2 and head towards Nad Al Sheba on the Meydan Road. 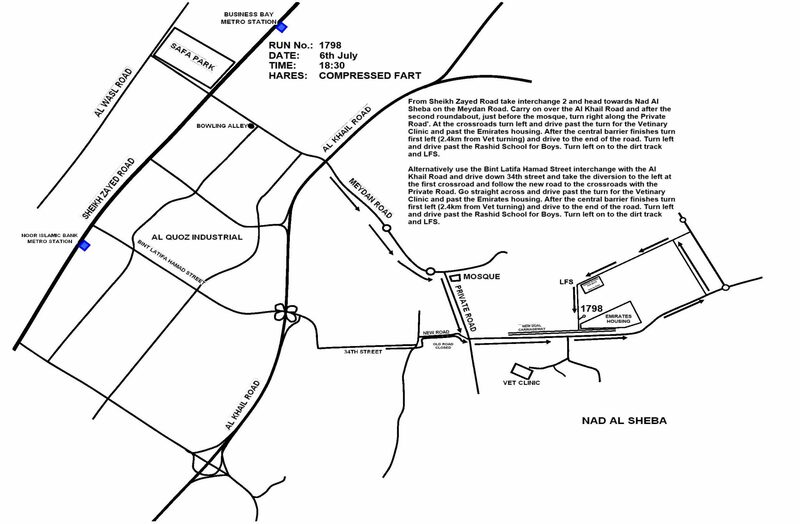 Carry on over the Al Khail Road and after the second roundabout, just before the mosque, turn right along the Private Road’. At the crossroads turn left and drive past the turn for the Vetinary Clinic and past the Emirates housing. After the central barrier finishes turn first left (2.4km from Vet turning) and drive to the end of the road. Turn left and drive past the Rashid School for Boys. Turn left on to the dirt track and LFS. Alternatively use the Bint Latifa Hamad Street interchange with the Al Khail Road and drive down 34th street and take the diversion to the left at the first crossroad and follow the new road to the crossroads with the Private Road. Go straight across and drive past the turn for the Vetinary Clinic and past the Emirates housing. After the central barrier finishes turn first left (2.4km from Vet turning) and drive to the end of the road. Turn left and drive past the Rashid School for Boys. Turn left on to the dirt track and LFS.